In this renowned comic play, adapted by William Ritch, the world of humans and fairies collide, love is lost and found, and found again! All the while, these charming characters bring us laughter and delight. 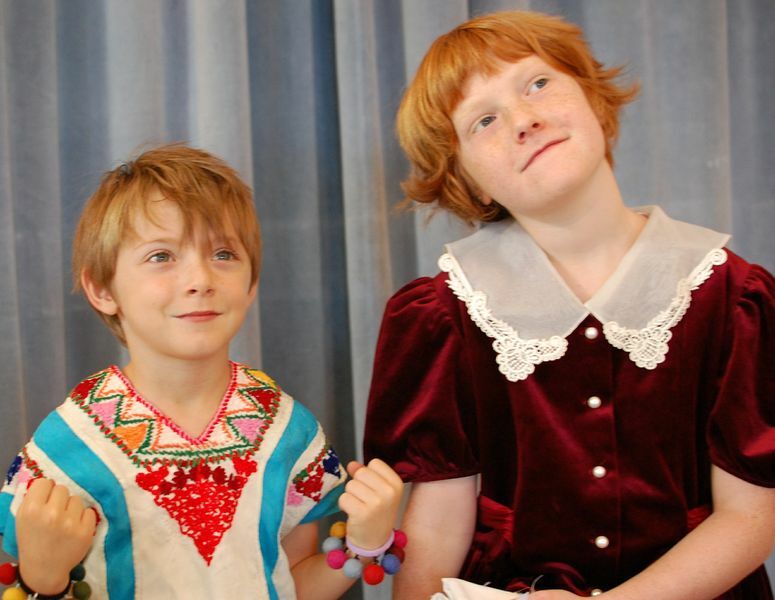 The play is introduced with a charming prequel, Fairy Revels, where we are once again in a fairy filled world, as sprites rehearse a play “Romano & Asiago” for their King and Queen. The Performance Class presents “Hamlet (creative & comically modified)” along with performances from our improv classes! Ashland Children's Theatre presents its 11th Teen Mystery Theatre production August 2018! It’s Hollywood at its most glamorous, set in 1945 on a movie studio where there’s more drama behind the scenes, then in front of the camera. Filled with intrigue and conspiracies, suspicious characters and Hollywood stardust, this thrilling and entertaining ride takes you through the black and white world of noir – but this time bringing it to you in living color, with laughs along the way. When Snow White dons her little red riding hood and the Frog Prince demands a kiss, we know we might need a little help getting through to the end of this fairy tale classic. A poisoned watermelon, a fugitive dwarf and a mirror distracted by pastry make an effort to derail this comedy for all ages. And though it may look as if it’s headed for a Grimm collision, rest assured, all will live happily ever after. All introduced with a charming prequel - A Mellow Drama and an improv performance from TeenProv. Back by popular demand! It’s a twist on the classic story and yes you will meet Cinderella and the “steps” as well as a prince, but wait there’s more! Imagine your surprise when an evil witch pushes her way into the story and two wacky godmothers hit the scene. You may even meet a dragon and a magic mirror. All introduced with a charming prequel - A Fairy Meeting. See the talents of our many students, including a "creatively modified" Romeo & Juliet. It's a delightfully funny rendition of Shakespeare's classic play, where the tragedy is not sooo tragic. A mash-up of original text and modern-day language, this mini melodrama production is fun for all. Each performance runs about an hour in total. $2 donation at the door at the Dance Space at 280 E. Hersey St. #10 in Ashland. Ashland Children's Theatre presents its 10th Teen Mystery Theatre production August 2017! It’s a hot sultry summer in Los Angeles in 1948. But wait! It’s also a chilly New York winter. Mesmerize is like a double feature detective mystery! Detective Milton Brown is trying to find his client’s missing sister in L.A, but he’s also reading the latest detective pulp magazine “The Cases of Casey Carter” who is on “The Case of the Missing Mustache.” The audience gets to see both stories play out on the stage. Two detectives, two capable gals, two villains, two nightclubs, two mesmerizing mysteries! 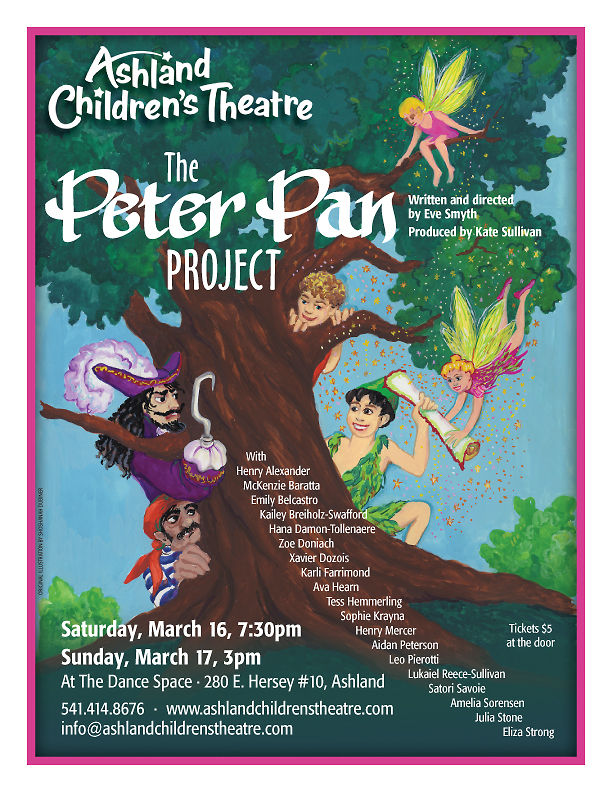 The Peter Pan Project is the story of Peter Pan who has lost his “Lost Boys” and is looking for some more boys to lose...or boys to be lost...new lost boys! Fairies and pirates join the adventures as Tinker Bell tries to help Peter, even though Queen Titania has forbidden it. Captain Hook and his pirates follow Peter here to Everland, and that can’t be good! Neverland, a short companion play to The Peter Pan Project, brings more pirates and fairies together in the pursuit of treasure, and preparation for the Fairy Fun Ball, welcoming the audience into the magical land, second star to the right. Ashland Children's Theatre presents its 9th Teen Mystery Theatre production August 2016! A missing package, a mysterious Egyptian nightclub singer, a murdered archeologist, and a lot of people who seem interested in a certain statue of the Egyptian cat goddess Bastet are elements that play into this mystery. But with private detective Phil Pearce on the case, answers are sure to be found. Phil and his sidekick Frank follow leads to the Natural History Museum and to the glamorous Isis Club as they try to shed some light on The Shadow of the Cat. And what about that attractive museum curator? Laugh your way into this 1940’s world of intrigue and suspense. It’s a twist on the classic story of Rumpelstiltskin - who is Rumpelstiltskin really? And why does he help the miller’s daughter? Take a greedy king, an alchemist in search of a minty otter, add a bragging father, and throw in some culinary trolls and you’ve got the makings of a entertaining story with fun surprises along the way. Simple joys and generosity save the day and yes, straw is spun into gold! Saturday, March 12th at 3:00pm and 7:00pm Sunday, March 13th at 3:00pm The Dance Space in Ashland, 280 E. Hersey St. Tickets $5/$10 available at Tree House Books and Music Coop in Ashland. What dost thou call thy disc of gluten embellished with such golden cheese? Forsooth tis a thing named pizza, which by any other name would still taste as yummy. See TeenProv improvise a tempest-like storm as they take on the Bard and your suggestions to bring you a show filled with merriment and laughter. Ashland Children's Theatre presents its 8th Teen Mystery Theatre production August 2015! The Maltese Falcon, Double Indemnity, The Big Sleep, all conjure a world of Private Detectives, Capable Gals, Hoodlums, and Femme Fatales. All this and more can be found in Birds Of A Feather, this year’s Teen Mystery Theatre production. This comedy in the film noir style is fun for the whole family and will have three performances only: Saturday, August 8th at 2:00pm and 7:00pm and Sunday, August 9th at 4:00pm. Tickets available at Tree House Books and Music Coop in Ashland. The Improv Games: TeenProv Showdown! 4pm : Make Believe Explorers, Creative Improv, Young Performers, TeenProv Company 7pm: Scene Study, Improv Fun, TeenProv, Young Performers, TeenProv Co.
It’s a twist on the classic story and yes you will meet Cinderella and the “steps” as well as a prince, but wait there’s more! Imagine your surprise when an evil witch pushes her way into the story and two wacky godmothers hit the scene. You may even meet a dragon and a magic mirror. All introduced with a charming prequel - A Fairy Meeting. Come see a short play performed by the Young Performers class, scenes from our Scene Study class, and a whole lot of improv fun. Laughter guaranteed. Come see our annual Teen Mystery Theatre production! 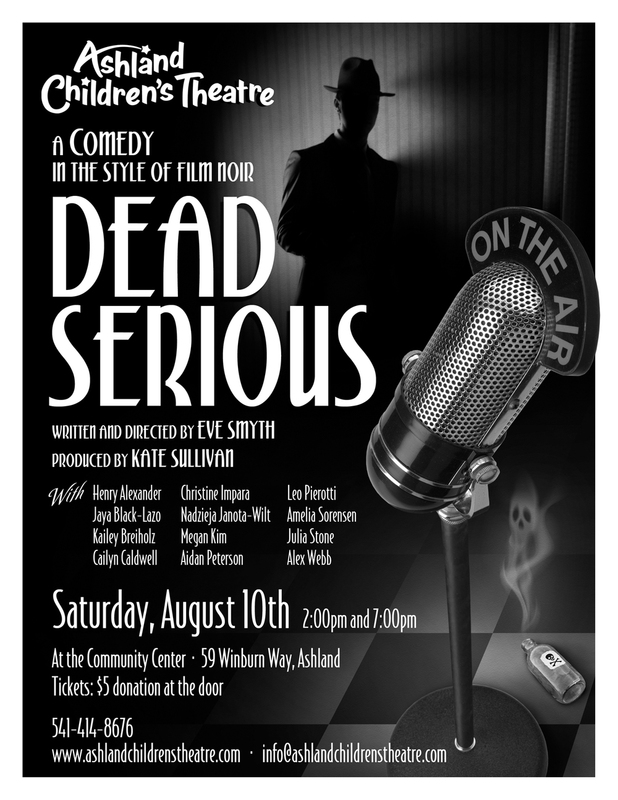 This summer featuring another "world premiere" of Dead Serious - a comedy in the film noir style. Two performances only at the Community Center in Ashland. 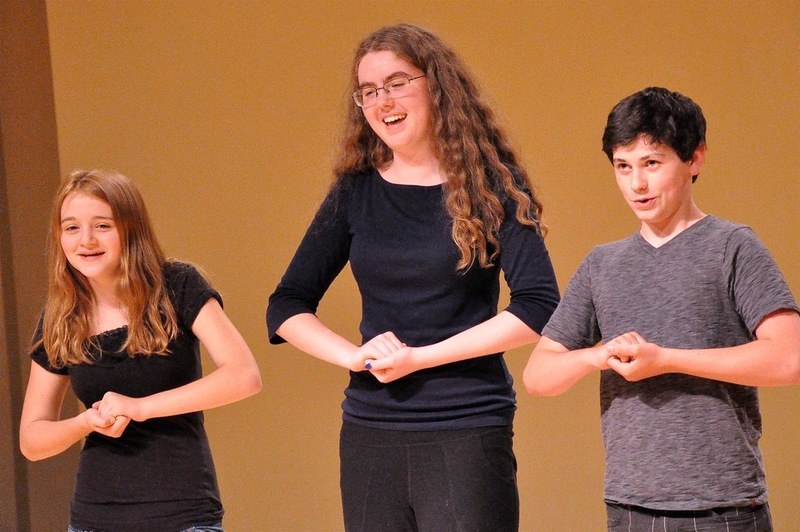 Come see the Teens kick out some awesome improv! With special guests The Hamazons. Pirates, and fairies, and children - oh my! Come see what happens when Peter loses his Lost Boys. Will he find some new children? Or will Captain Hook find them first?